Photo: Coffin Point Plantation, ca. 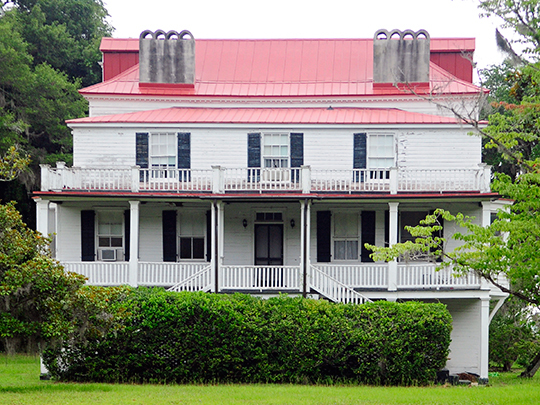 1801, Seaside Road, St. Helena Island, Beaufort County, SC. Listed on the National Register of Historic Places in 1975. Photographed by User:Bill Fitzpatrick (own work), 2012, [cc-by-3.0 (creativecommons.org/licenses/by/3.0)], via Wikimedia Commons, accessed January, 2014. The Beaufort County Courthouse is located at 102 Ribaut Road, Beaufort, SC 29901; phone: 843-470-5319. In 1710, the Lords Proprietors of Carolina ordered the establishment of Beaufort Town, in honor of one of the Lords Proprietors, the Duke of Beaufort. The location of the town was chosen primarily because it offered a safe harbor on the Beaufort River away from the open Port Royal Sound. The growth of the town was initially slow due to its remote island location, skirmishes with the Yemassee Indians, and the continued threat of invasion by the Spanish. In 1721, it was reported that there were only thirty white and forty-two black inhabitants. Concerned about the defense of the area, authorities in Charles Town appropriated 1,500 pounds to construct a fort at Port Royal. In 1734, a tabby structure named Fort Frederick was constructed on the Beaufort River under the supervision of the colony's treasurer, Alexander Parris, for whom Parris Island is named. Unfortunately, Fort Frederick was poorly situated and rapidly deteriorated until it was finally abandoned. Tabby ruins of Fort Frederick still exist at the site near the Naval Hospital. When Fort Frederick was abandoned, a new, more formidable tabby fort named Fort Lyttelton was built upriver at Spanish Point, and was used through the Revolutionary War. Not only did the town of Beaufort develop slowly, but the Sea Island planters did not share in the great wealth being accumulated by the rice and indigo planters of the Charles Town and Georgetown areas. The lack of large freshwater swamps so plentiful on the mainland prevented them from having success with rice, the colony's most profitable export crop. Indigo was the most profitable money crop on the islands and was supported by an imperial bounty which was abolished after the Revolution. Rather than owning huge plantations tilled by hundreds of slaves, the average Sea Island area planter was middle class and owned few slaves and roughly 500 acres of mostly wilderness. It was not until 1763 when the English finally solidified their hold on North America and the Colonial wars ended that the Port Royal area began to experience prosperity and growth. Between 1763 and 1776 the population of the area quadrupled. The economy grew with the population and the area became a center of the shipbuilding industry. As sentiment for a break from England grew in the colonies and among some Beaufort people, many of the prominent families like the Bulls and the Stuarts remained Loyalist. As a result, the revolutionary government in Charles Town had little confidence in the residents of Beaufort. The smuggling of contraband to England in defiance of colonial authority was a constant problem. The early years of the Revolutionary War were relatively quiet in the area. Then in February 1779, the British attacked in what was to become known as the Battle of Port Royal. While the battle was an American victory and the British were repelled, the American forces left soon after to aid in the defense of Charles Town. The British then occupied Beaufort and Port Royal Island and remained until near the end of the War. Frequent raids on plantations and settlements along the area's rivers were conducted by the British from Port Royal causing extensive damage. After three years of occupation and warfare, the area was devastated. A returning citizen noted that "all was desolation ... every field, every plantation showed signs of ruin and devastation." The area did, however, produce some revolutionary heroes such as Daniel Heyward, Jr., and John Barnwell. County Council, Beaufort County South Carolina, Beaufort County Comprehensive Plan: History, 2010, www.bcgov.net, accessed January, 2014.